Next morning we woke at 5:00am to be at the airport for our early morning flight to Pakse at 06:30am. Many local flights in Southeast Asia are operated at 06:30. Our local guide & driver were waiting at Pakse airport. The city of Pakse retains the French colonial old houses & the atmosphere of the 1950's. Time seems to have stood still in Pakse. 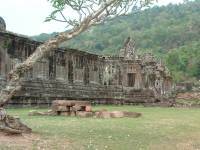 We drove to Champassak to see the ruins of Wat Phu. 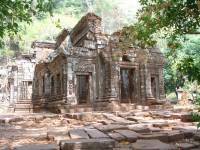 This temple was built before Angkor Wat in Cambodia., although you can see the similarities in the remainsof Wat Phu. Hundreds of steps climb up 'between earth & heaven', with a spectacular view of the Mekong River & surrounding countryside from the top. My guide pointed out that a path to the left before the steps would lead you eventually to Angkor Wat in Siem Reap, Cambodia. The walk would take weeks to complete - it sounds interesting but also a bit frightening! The nearby museum displays sandstone sculptures & figures from Wat Phu. Our lunch was at Suchikta restaurant, a simple & lovely local restaurant perched on the edge of the Mekong River. Our lunch menu included spring rolls, fried noodles, fried rice, papaya salad & grilled fish - the last two being the best I had during the whole week in Laos. The fish was fresh & tender because it had been just caught from the river. We washed down the meal with Beer Lao as usual whilst enjoying the river view below the restaurant's wooden platform. The little son of the restaurant owner was sleeping quietly on a mat in the middle of the restaurant. Wonderful. After lunch, we boarded a long-tail boat to Khong Island, a pleasant journey of about 4 hours. The arrival at Khong Island was lovely - the boat cruised among the lush greeneries of the small islands before reaching the 3* Villa Muong Khong hotel pier. This is the best & only 3* hotel on the island, the other accommodation on the island being mostly guesthouses. The Villa Muong Khong hotel is simple and in local style, with basic but clean & comfortable rooms with good bathroom facilities., but no television in the room. 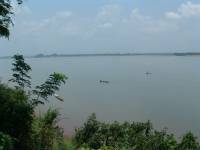 The 32 rooms are built around a lovely garden, and the restaurant is situated at the front of the hotel with wonderful views of the Mekong River. We took our dinner at one of the local restaurants along the cliff overlooking the river below. After nightfall it is very dark as there is limited street lighting. The few restaurants along the rivers edge are softly lit by strings of light bulbs above, all part of the charm that we travel all this way to experience. There was also a power cut during our meal , plunging us into complete darkness, but fortunately power was restored again shortly. This time the most memorable thing from this meal was the dessert of fresh pineapple & banana, the fruits deliciously sweet & tasty and almost perfumed. It was a joy. Next morning we travelled by boat along the river with interesting views of Don Det Island. 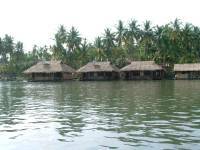 All along the river bank there are many traditional stilt houses, some of them guesthouses. This part of the river is very shallow & water buffalos rest in the water sleepily. We stopped at the pier of the Sala Phae Floating guesthouse and restaurant to visit Don Khone Island. Sala Phae Floating guesthouse is lovely with only 6 floating wooden bungalows all of which have a sitting platform outside with view of the river & the water running beneath your feet. Nearby, a lovely traditional French colonial white building houses 3 beautifully furnished guest rooms, whilst several Lao-style traditional wooden stilt houses in the garden are furnished in traditional local style. All three accommodations are all beautifully done in their separate ways, and we decide to use them for our clients staying overnight on this island. We were picked up by two motor bikes & rode around the island. The roads here are mostly just sandy tracks - a motor bike is the best form of transport. First we visited the Liphi Waterfall. It is very spectacular because of the big rocks that make that water spurt out dramatically in many different ways. 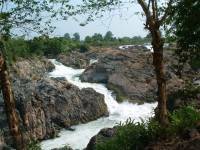 In the rainy season the water cascades down very fast, violently buffeting the rocks like stormy waves. Afterwards, we visited the local village & the abandoned railway track, unused for many years. 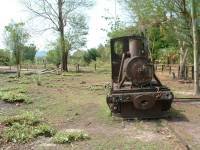 The rusting engine has been left there as a museum piece. We took the boat back to the main river bank, and transferred by car to the Khone Phapheng waterfall - the largest falls in South East Asia with magnificent views. It is stunningly beautiful. Back to Pakse in time for lunch at the lovely Riverside restaurant built on a floating platform with stunning views of the river and a very welcome breeze. The food was good with grilled chicken, fish & rice (washed down with our favourite Beer Lao, of course). After lunch we drove toward Tatlo through the Boloven Plateau where there are many tea & coffee plantations. We visited Mr. Nguyen's Tea & Coffee Garden plantation. Mr.Nguyen was born in Vietnam but has been living in Laos almost all of his life. He showed us the procedure of tea production, but if anyone wishes to see it in action one has to visit the plantation in the morning before 11:00 as most work starts from 5:00 & is finished by 11:00. We tried his green tea & it was most refreshing. I brought two bags, the price was excellent. 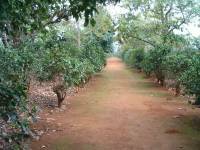 We also visited a coffee plantation but no work was being done as it was not the season. Dark clouds began to gather above so we decided to drive back to Pakse. The rain came down like a waterfall on the journey back. We checked in at the 3* Champa Residence hotel, a lovely colonial building with lush gardens. The room was simple & fairly basic with good bathroom facilities. There is a homely feel about this hotel, the owner, Mr. Somphonesay, is around to talk to you in the garden sitting area. 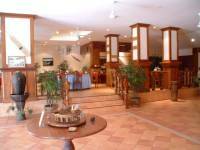 We will use Champa Residence & Pakse hotel in Pakse. The 3-4* Pakse hotel is a historic, slightly art-deco building. The lobby entrance is very imposing with an atmosphere of bygone years. Mr. Letemplier, the manager, showed us around. All the rooms are nicely decorated with character especially the interesting homemade wooden lamps. The roof top bar/restaurant offers good views of the city & river. This is the best hotel in Pakse city, and is undergoing many improvements. Next day we flew back to Vientiane to bid goodbye to our agents (over more Beer Lao) and connect to our late afternoon flight to Hanoi, Vietnam.